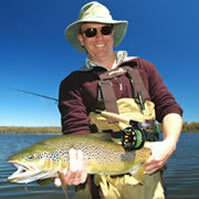 Excellent sight fishing Tailing trout and may fly fishing on streams. 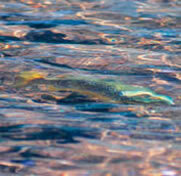 Tailing trout. Polaroiding, dry fly and stream fishing. 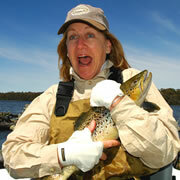 Premium month for dry fly fishing lakes. All types of fishing available. Dry fly fishing. Early beetle fishing, tailing trout and nymph fishing. Beetle fishing at its peak. Jassid hoppers in season, nymph and tailing trout, and hoppers on small stream. Exclusive access to our acclaimed lakes and to other private fisheries throughout the state can be complemented with challenging wilderness fishing or picturesque rivers that flow through farmland steeped in European history. Access to private and remote places is part of the exclusivity of our fishing trips. 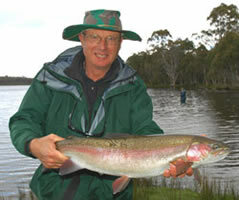 An experienced, friendly and knowledgeable guide is essential to success in Tasmanian waters, where trout can be difficult to find and even more reluctant to accept our offerings. A visit is your chance to learn about wildlife, ecology, animal behaviour and the many elements needed to create a balanced fishery. 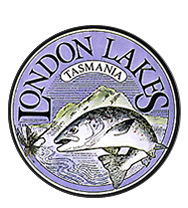 Our experienced team of guides provides a professional guiding service that is based on many years of industry experience helping guests to catch wild trout in Tasmania's Central Highlands. If you are curious about fly fishing, they can give tuition that will create the platform for a lifetime of enjoyment in some of the most tranquil settings nature has to offer. Stalking large brown trout as they fossick in the shallow margins of gin-clear lakes offers a challenge to test the seasoned angler's skill, stealth and nerve. Sight fishing is supremely exciting because it is predatory and anticipatory. 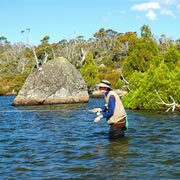 To catch good numbers of fish in Tassie, you must be understand the effect of changing conditions on fish behaviour. Learning this comes with time and experience on the water. There is no better way to increase your knowledge and chances of success than to go fishing with good company, armed with sound advice and optimism. Husband and wife and father and son packages are a speciality. Begin a pastime together that will bring many hours of enjoyment and strengthen the friendship. There is no set daily fishing program - appetite and weather govern our movements. Food, accommodation, guiding, equipment and registered 4WD vehicle transport are included. Learn the art, feel the inspiration, revitalise the soul…. Bring your gear or use some of ours for a relaxed guided experience with tuition if and when you want it. The Central Plateau World Heritage Area has been shaped by dramatic geological events that have indelibly etched the landscape. It plateau is an inspiring and secluded wilderness experience for the adventurous. Those with an eye for photography will be in their element. 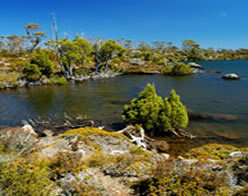 An adventure here can unlock the secrets of Tasmania's world famous wilderness lakes and reveal world class fly fishing amidst spectacular natural beauty. We hike into remote tarns at 1200m above sea level. The region is locally called “the land of 3000 lakes”. 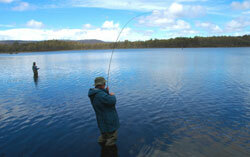 We may fish up to 20 different waters during our trip. These snow-melt tarns with shallow margins and gin-clear water are ideal for experienced anglers to test their skills against trophy wild trout. The fish are big and smart. They experience little fishing pressure - indeed, most probably never see a person. The area we visit is accessed by fewer than 20 people per year and there is no sign of previous adventurers. 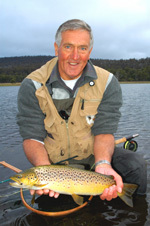 The result is fantastic sight fishing to large, confident brown trout. Inquire about a tailored package to suit your appetite and time frame. 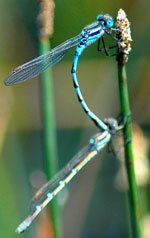 To ensure your safety, a seasoned London Lakes guide must accompany all fishing. 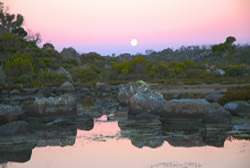 Fly Fishers Lodge and Wilderness Retreat, Tasmania. We are having great success this season. After good spring rains, we have experienced tough but consistent angling to tailers and superb dry fly fishing to midgers since October. Several large bags on Big Jim have exceeded 4 lbs in average weight and almost every fish has been superbly conditioned. ..